Up to this point, we've been making tea. Thick, grainy, sweet tea, but tea nonetheless. In order to make the final transformation to wort, we need to bring every piece of the brew day together for one last stage in our boil kettle. As we discussed last time, hops are the key ingredient in that transformation, both flavouring and sanitising our wort. With hops, though, everything depends on temperature and time; Dogfish Head even produce a range of beers named for the length of their hop boil. For us and many others, 60 minutes is the standard for extracting the full potential of big bittering strains like Magnum, Summit, and CTZ. There are exceptions to this rule, of course. Lagers, which rely on an extremely clean flavour profile, benefit from a longer boil to gas off undesirable sulfur compounds that may be present in the very pale malts they employ. Imperial Stouts and Scotch Ales take advantage of 2-3 hour boil times to both concentrate and caramelise the wort via Maillard reactions. But for standard ales like our Red Shift, 60 minutes is plenty. If we only added hops at the 60 minute mark, our wort would be bitter but characterless. Remember, hops are multi-purpose ingredients which can be used at almost any stage of beer production. The later we add them, the less we convert their acids to bitter iso-alphas, and the more we retain of their volatile aroma compounds. 15-20 minute additions are typically known as 'flavouring hops', because they hit the middle ground between bittering and aroma. At Gravity, they're combined with all our other late additions: yeast nutrient, clarifying agents, adjunct sugars like lactose, and mineral salts for final adjustment of our water profile. 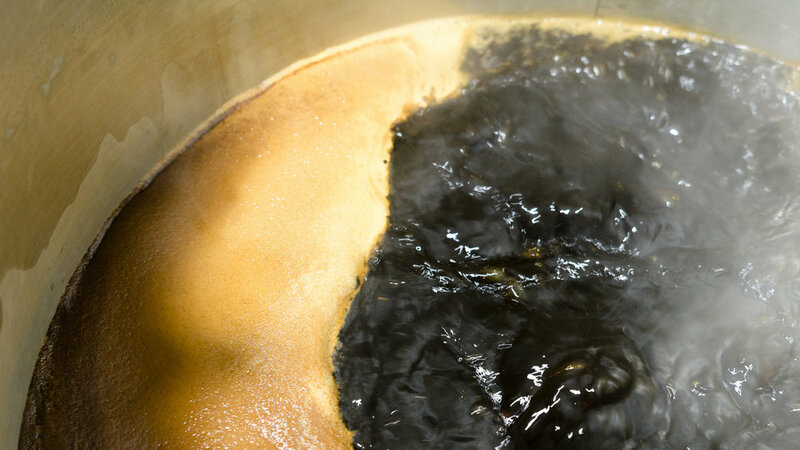 When we stop the boil and begin cooling our wort down to fermentation temperature, we'll make a third hops addition. These 'aroma hops' are typically strains with lower alpha acid content, and make up the bulk of the celebrity hops people are familiar with these days: Citra, Amarillo, Centennial, Mosaic.. the list goes on. What's common to all of these strains is a high concentration of volatile aromatics which give IPAs their typical fruity, juicy profile. If we want to enhance that profile, as in the case of our Imperial IPA, we can make a 'hop stand' – essentially pausing the cooling process somewhere in the 70-95C range. Because these temperatures pasteurise without converting alpha acids, hop stands are hugely useful not just for hops, but also other flavouring additions like tea and spices. Once all our hops additions are complete, we chill the wort down to 20C, 'whirlpooling' as we cool to concentrate the hops and grain solids at the bottom of the kettle and allow us to transfer clean, clear wort across to our fermenters. We'll be taking a look at the cold side in two weeks, from fermentation to packaging, to finish off our introduction to Gravity. Until then, happy drinking! © 2019 gravity brewing kft.